Vern and I are going all out on this book tour, with lots of Vern posts and prizes, too. Check out the schedule and hope to see you around the blogsphere! * indicates a prize being given that day, either a free e-book or something from Vern's warehouse. Like 007? You'll LOVE Dragon-Oh-Seven! The magic is Faerie. The technology, Mundane. When they meet, the survival of the world rests in one dragon's…er…claws. See Vern as you've never seen him before! 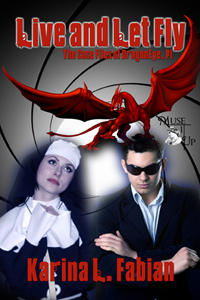 For a dragon detective with a magic-slinging nun as a partner, saving the worlds gets routine. So, when the US government hires Vern and Sister Grace to recover stolen secrets for creating a new Interdimensional Gap-- secrets the US would like to keep, thank you—Vern sees a chance to play Dragon-Oh-Seven. No human spy, however, ever went up against a Norse goddess determined to use those secrets to rescue her husband. Sigyn will move heaven and earth to get Loki—and use the best and worst of our world against anyone who tries to stop her. Then you'll love Live and Let Fly! Suddenly, a well-muscled and gorgeously scaled tail whips out from the crack in the door and wraps itself around his neck. He only has time to grab ineffectively at the tail before he's drawn into the darkness. The door shuts behind him. I slammed my victim on the floor and pinned him with my forelegs, then I leaned my face in nice and slow, making sure he got a good look at my fangs before he saw my eyes. "Where's the girl?" I growled low and menacingly. Charlie crouched down by Stutterboy and glanced at his name tag. "Look, Philip, we're in a bit of a hurry. We know Rhoda Dakota's being held captive somewhere nearby. Now you can be a good survivor and tell us where…or you can be dinner." "Phil A. Minion." I mused and drooled a bit for effect. I live for these moments, I really do. I licked his cheek and asked Charlie, "Can I have fries with that?" "Why not? This is Idaho." You can buy Live and Let Fly at http://tinyurl.com/LiveAndLetFly or Amazon. Let me start with the basics of Faerie dragons: We're immortal. We're androgynous. We don't reproduce. We were created at the beginning of time from God's greatest imaginings and have been around ever since. So we have no use for lust. Greed, however, is a different matter. What's the deal with dragons and greed? We're natural hoarders, like I mentioned in my Apologia on Dragon Greed. At any rate, I'm not here to psychoanalyze my species. I want to compare lust and greed. I've had the unique position of being in human form, with all its accompanying, irritating hormonal consequences, once "helped along" by a curse I still owe a demon a roasting over. So, I've felt lust, and I've got to tell you, it's not all that different from greed. For one, it's a basic emotional desire--object or person, it's still that kind of feeling. At its heart, it's about possession: permanently or until you lose interest, the goal is to own that object or person in some way. It's the same for lusting for power: you want to make it yours. Of course, there's a certain biological mechanism involved. If humans weren't attracted to each other, there wouldn't be much "fruitful and multiplying" going on. Since dragons don't procreate, we don't have that mechanism, and thus don't lust. However, as hoarders, we do have the mechanism for collecting, which makes us susceptible to greed. Every species has its weak point. The problem, as I see it, is when you let that biological drive get the better of the spirit God gave you, i.e., your conscience. Of course, that also means the remedy is the same for both--a clear conscience guided by perspective and prayer and some proper education in moral values. Works for greed as well as lust. Unless, of course, you're a dragon cursed into human form and influenced by enchanted perfume, but that's a story I don't plan on sharing anytime soon. C'mon. You know you want it. What was I talking about again? Oh, yeah. Greed. Here's the short of it: Dragons have a hoarding instinct. We are built to want stuff--and not necessarily gold and jewels. That, ironically enough, is a stereotype placed on us by humans. I have a friend, Hrrowrssh, who had a fondness for joints. You know--elbows, knees, hips. He's got a collection stretching to the Paleolithic. He actually had the dwarves carve out a mountain so he could display them. I once spent fifteen years with him, just going through the collection. My favorites were the ones of things he'd eaten himself. My own tastes change. I like relics--or things I suspect will make great relics someday. I'm quite a connoisseur at it, actually. I know a lot of you probably think any old piece of junk becomes a relic if it's old enough, but real relics have history, meaning, and significance. Your singing fish plaque ain't gonna cut it, no matter how many thousands of years it survives. Now you can blow off our desire to acquire as simple sin, but it has its uses. For one, where are you going to find a better collection of joints in both universes. (And you can laugh, but the paleontologist of your era have been drooling over my friend's odd habit.) I have object (now priceless) that would have been erased from history by now, some for civilizations long forgotten. "Well, what good is that, if you're the only one who has them?" you ask. Three words: Lance of Longinus--and if you don't get the significance, you will once Karina publishes "Greater Treasures." next month, maybe. Suffice to say, some relics should not be left to other species. Dragons know how to hoard, protect...and leave well enough alone. I'll tell you more about the lance some other time. For that matter, it's a misconception that dragons greedily hang onto their wealth. We have been known to display certain selections--if the visiting party can keep their paws off it. Think of all the trouble tourists have caused with flash photography, greasy fingerprints, and "no one will miss this pretty rock." We will also redistribute on occasion. I sold an artifact I'd kept for 8000 years to a museum because it completed its collection. Dragons have rules, just like humans have rules for gaining wealth. We don't raze villages in order to get a sparkly. However, if that village has come after one of us with the proverbial pitchforks and torches and we raze the village in self-defense, why not grab the sparkly? Hrrowrssh never went around biting the elbows off interesting creatures, but if he certainly took them off his prey. We are always glad to accept gifts, trade, grant favors for items, etc.--dragon commerce. And yes, we have a stash of gold and jewels--but usually that's in case we see something we just have to have. Once again, Karina has gotten into a discussion about dragons and how she should not write the adventures of one because they are creatures of evil. Count the heads, please. Thank you. But say, you don't buy that. After all a dragon is a dragon, no matter how many heads, right? And if the bible says the dragon is the symbol of evil, then all dragons are evil. Well, let's talk serpents, shall we? It wasn't a dragon that tempted Eve, but a serpent, right? And when the Israelites complained against God, what invaded their camp? Serpents. But I see serpents all over this earth. You keep them as pets--even good Christians do. But some are "good snakes," you say? So some snakes are good, but all dragons are bad? Speciest, if you ask me. So, God used the serpent for His will. One of the kids from Church asked me to go to show-and-tell this week. The teacher had a fire extinguisher handy. Seriously? I may be from the Middle East, but I have more self-control than that. Anyway, the kids were sufficiently impressed and I used my charm on Mrs. Willoughby, so it turned out all right. The kids asked the usual second grade level of questions--no Mensans there*--and then I invited them to pet me. That's why I bother with these things, you know. Who needs a masseuse when you can have 30 little kids give you a good scale rub? and the little hands are perfect for scratching behind my cheek crests. No, I do not thump my leg like a dog. I can, however, be coaxed into a purr. It always ends too soon, but I go home happy and relaxed. Stan calls me a sensualist. I just tell him it's a dragon thing. He wouldn't understand. *In Magic, Mensa and Mayhem, Vern does show-and tell for the kids of Mensans. That's where he learned his tail spikes are called thagomizer. Wisdom of the Ages. Experience of Eternity. Treasure Found. Virginity confirmed. Saving the Universe Extra. --You've got trouble the Mundane police can't handle. --You're a Faerie in the Mundane universe looking for help from one of your own kind. --You're a Mundane with trust issues. --You're goofing off at work...again. Regardless, you've come to the right place: The Dragon Eye Private Investigations Agency. I'm Vern, a professional problem solver in two universes and yes, a for-real dragon. Sister Grace, my partner, is a mage from the Faerie Catholic Church. Need high-powered magic or magic from On High? She's your nun. We'll handle just about any case that pays and, being a dragon, I'm not particular about how I get paid. Cash or carrion, I'm your dragon. We do everything from find lost pets to save the universe--sometimes at the same time. Hey, I'm a dragon. I can multi-task. Karina Fabian novelizes our cases. Check them out on this site, or better yet, check them out at the library or Amazon. It helps the dragon, and that's a good thing. Want Info on Infinite Space, Infinite God? Want Info on "Perfect Ten?" Yeah, I used Blogger's Simple Template. 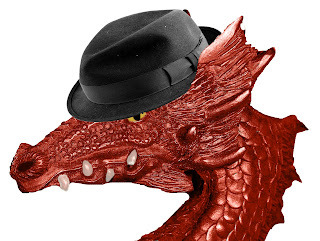 I'm a dragon detective, not a web designer. Simple theme. Powered by Blogger.